Cosmic Crisp® apples grow on trees at the WSU Sunrise Research Orchard near Wenatchee (WSU Photo-Scott Weybright). 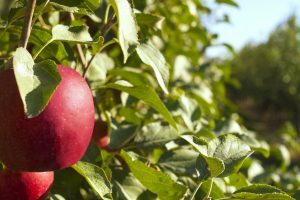 Tree fruit experts from Washington State University will update growers on the new WA 38 apple variety and Cosmic Crisp® fruit at the WA 38 Field Day, Tuesday, Sept. 11. Held in two locations this year, the field day offers an in-field opportunity for growers to view test blocks and learn about management and development of this highly anticipated variety. The first event is 10 to 11:30 a.m. at WSU’s Roza Research Orchard, 53002 N. Crosby Rd., Prosser, Wash. The second tour is 3 to 4:30 p.m. at WSU Sunrise Research Orchard, 115 Sunrise Court, Rock Island, Wash.
A cross between Enterprise and Honeycrisp designed specifically for Washington growers, WA 38 is the result of a 20-year breeding effort at WSU. Exceptionally sweet, crisp and tart, the WA 38 fruit is slow to brown when cut and keeps its flavor in storage. An estimated 5.8 million WA 38 trees have been planted for the launch of the new variety, which is expected to be available to consumers starting in 2019. The Field Day is free, and no registration is required. PVM, a Yakima-based company specializing in the management of proprietary varieties, will attend to answer commercialization questions about WA 38. To learn more, contact Karen Lewis at 509-760-2263 or by email at kmlewis@wsu.edu.